OptioNow are no longer trading. For a list of alternative brokers, and full comparison reviews, visit our brokers page. Owned and managed by a holding company called Zluti Marketing Limited, OptioNow is a new binary options broker that is based out of Anguilla. Although OptioNow is headquartered out of Anguilla, they also operate from several other offices located around the world in order to service their traders better. The trading platform was originally established by a group of financial professionals that are well versed in the field of offline and online trading. With their company’s primary focus on honesty, integrity and professionalism, OptioNow hopes to draw more binary traders regardless of whether they are beginner or experienced to join them for a fulfilling trading experience. Although their trading platform closely resembles many other binary brokers’ trading platform, that is where the similarity ends. The trading platform used by OptioNow is in fact the advanced second generation SpotOption platform. Looking closely, traders can find on this platform features such as “Ladder” trading, a new type of trading option. So far, there are only a handful of binary brokers out there on the internet which have adopted the second generation SpotOption trading platform. With the adoption of SpotOption Gen2 platform, OptioNow is able to offer their traders a greater choice of trading contracts. Now in addition to the normal binary contracts such as Classic Binary Options, Sixty seconds and One Touch, traders are also able to trade with longer term options, Ladder options, Pairs, and CFDs. When OptioNow was first established late last year, one of the initial complaints about the trading platform was the limited number of tradable assets. Now, we are pleased to see that they have expanded their asset list to cover over more than 120 different types of assets. This shows that this broker is receptive towards the needs of their traders. As for trading accounts, OptioNow understands that their clientele base comprises of traders with differing levels of trading experiences. As such, OptioNow have come up with 5 different types of trading accounts to suit their individual needs. 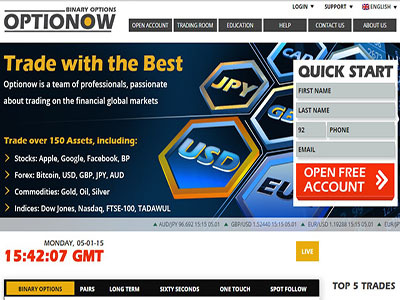 Currently OptioNow’s website is only available in English, Russian and Arabic. However, we hope that they will be able to cover more languages in the near future. As for customer support, the service is available nearly 24/7. Help at OptioNow is only a phone call away and their multilingual support staff are ever ready to assist traders in any way. To get in touch with customer support, all traders have to do is to drop them an email or leave their contact details on the web contact form at their website. If traders wish to call customer support, they can do so at the following number: 1-855-258-7976. The only complaint that we have about this broker customer support service is the lack of live chat. This can prove to be an inconvenience if you just want a fast answer to something minor. On average, traders can expect a return of 80% with their investments on normal trades. However, we have seen that the returns can reach a maximum of 85% for certain frequently traded assets. If traders find this ratio inadequate, they can try out the One Touch trades which offer returns as high as 450%. Of course, we have to bear in mind that One Touch trades are much riskier hence the higher returns. As for bonuses, they currently offer a maximum of 100% deposit bonus. Having gone through their services, we find that OptioNow is indeed dedicated to providing their traders with a fulfilling trading experience. We seen how they have acted positively on past shortcomings based on their traders feedback. This tells us that this broker is generally receptive towards their traders’ needs. We hope that they will not let traders down and will continue to further improve the quality of their services as time goes by.